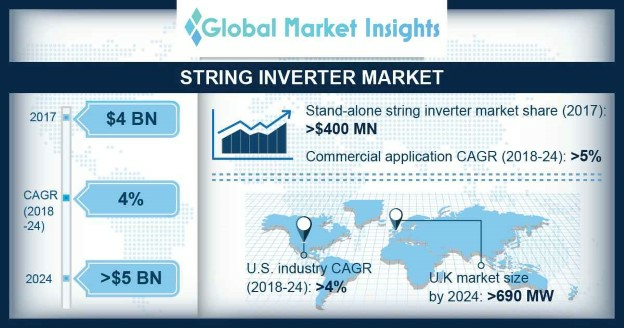 String Inverter Market size is set to exceed USD 5 billion by 2024; as reported in the latest study by Global Market Insights, Inc. Surging investments toward effective deployment of clean energy technologies will accelerate the global string inverter market size. Development of large utility scale solar photovoltaic projects with an aim to reduce the dependency on conventional systems will further add to the product demand over the forecast timeframe. In 2018, KACO new energy launched blueplanet 125 TL3 string inverter which on account of its low weight and high-power density is gaining wide acceptance across small scale utility projects. U.K. string inverter market is anticipated to expand over 690 MW by 2024. Rising investments toward the development of high capacity grid connected PV projects will accelerate the product penetration across the region. In 2015, Greencells Group announced the completion 62 MW solar photovoltaic project across the UK comprising of 2,200 string inverter units. Declining component prices owing to various tax redemption measures by the regulators will facilitate the expansion of string inverter market over the forecast period. Manufacturers significant investments to enhance their existing R&D capabilities will further reduce the component prices thereby positively impacting the inverter demand. Brazil string inverter market is expected to witness appreciable growth on account of favorable regulatory norms established by the policymakers toward clean energy. In 2018, Huawei FusionSolar announced to supply its inverter systems to the country’s first digitalized utility scale photovoltaic project having capacity of 75 MW. Canada string inverter market is anticipated to witness substantial growth on account of government measures to effectively capitalize the nations diverse unconventional energy potential. Numerous socioeconomic factors including greenhouse gas (GHG) emissions targets, and deregulation have created significant investments in the clean energy sector, thereby raising the product demand. Stringent emission reduction norms established by regulators will significantly expand the string inverter market share globally. Ongoing grid integration plans for renewable energy sources followed by positive government measures including tax incentives will further enhance the industry growth. Commercial string inverter market is anticipated to expand over 5% by 2024. Positive consumer outlook favored by fiscal benefits associated with the deployment of solar components will raise the product demand. In addition, optimistic regulatory approaches across emerging countries focusing on decentralized systems with rapid enhancement of distributed generation technologies will favor the global industry outlook. On grid string inverter market is anticipated to witness exponential growth on account of significant investments being carried out by both public and private entities toward development of large capacity projects. Implementation of mechanism such as fed in tariff and reverse auction will positively stimulate the industry growth. Major players across the industry includes Solar Edge, Growatt New Energy Technology, Chint, GoodWe, Ginlong Technologies, TBEA, Samil Power, Sungrow, Fronious, REFU, Elektronik, SatCon, Schneider Electric, Shenzhen KSTAR, SMA Solar, KACO New Energy, Delta, Omron, SolarMax, Elettronica Santerno, Huawei, and ABB.